I love any excuse for a celebration so when a birthday rolls around I'm the first to get excited. Particularly when it's my own. I celebrated turning 26 last Wednesday and my friend Emma and I had only one place in mind for the dinner. Bob Bob Ricard. You may not know the name but I'm certain you've seen the "Press For Champagne" button. Ingenious invention if you ask me! I read an article the other day that said 42% of Brits say their most difficult decision of the day is deciding what to eat for dinner. I'm totally one of those people. I don't understand, how after eating dinner every day of my life, I still often draw a total mind blank about what to cook. But never fear, I'm here to help us all with a tasty, easy AND healthy idea. I’m pretty excited for the arrival of summer as I’ve got an incredible 4-week trip planned. Even better is the fact that Mum’s flying over from Australia to share it with me. Most of the destinations I’ll be hitting are by the beach, hence a bikini body is required. Cue full body workout with ballet whizz kid Aaron Smyth. Saturday mornings are my favourite time of the week - everyone seems extra cheerful, the city moves at an easier pace and there's plenty of time to catch up with friends - of the human and furry variety. Soph and I heard a whisper that Chiswick had a new little hotspot so we took a stroll round the river [along with my favourite golden retriever Amy] and headed for No. 197 Chiswick Fire Station for a bite of lunch. Summer is edging closer so now's the time to start considering your style for the new season and the look to get in line for [literally!] is stripes. 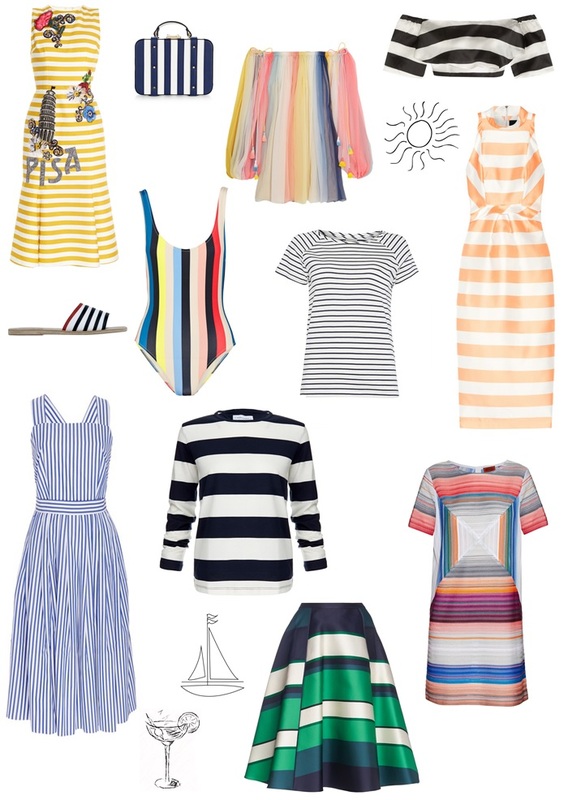 I personally love a Breton tee and, of course, you can't go past a sailor-inspired bikini. There's no doubt, the season's new collections are zinging with sassy stripes of all shapes and sizes. From pinstripe to super sized, vertical and horizontal, or even mix-matched. There's figure-hugging cuts and billowing silks, proving the stripe is not just about nautical connotations. I say nab these top picks and dip a toe into the trend for a fresh start to your summer. The longer I've lived in London, the more I've come to understand that brunch is a very loose term here. Back in Aus, brunch meant a meal between 9 and 10am, 11am at the very latest if you were stuggling to get a move on. Here in London you can get brunch at any old time - even 4pm. The first few times I met up with British friends I was quite confused. They'd say "let's do brunch" so I'd clear my morning only to find they'd booked a table somewhere at 3pm. What? Nearly two years later and I've finally adjusted. You could almost say it's my favourite meal of the day now because it can happen any time! When it comes to what to eat, if you're staying in and cooking, this easy one-pan option is a total winner. Following on from the incredible meal I enjoyed at Le Saint James while in Bordeaux the other week, when presented with the opportunity to join one of their cooking classes I thought, how could I say no? This is a Michelin star kitchen we're talking about after all. As you know I love cooking, just last weekend I spent the afternoon whipping up a batch of ANZAC biscuits. And whilst I fancy myself as a bit of a skilled cook, I certainly don't find myself throwing together fine dining dishes at home. But with my new skills, these recipes [and a few thousand pounds in kitchen equipment] I totally could if I wanted to. I love France. I feel as though it's a bit like my spirit country. Every time I go back it captures me with its architecture, its way of life, its language.